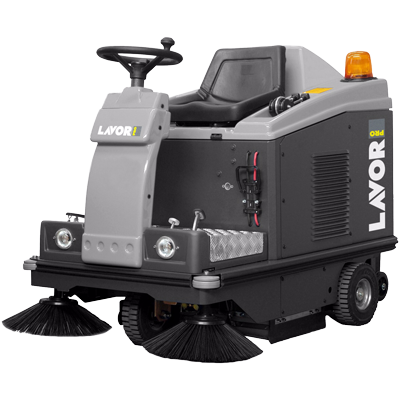 The SWL1000ET Ride On Sweeper/Vacuum is a battery powered industrial floor sweeper for large factory/drive through areas. This ride on unit is capable of sweeping 6200m2/h with a working battery life of up to 5 hours. As a result of these specifications, this allows for some seriously fast cleaning. Equipped with 6 different filter cartridges, the machine ensures all the dust stays inside the unit’s collection 62 litre bin. In addition, there’s a dead man safety switch on the seat and a flashing safety working light. 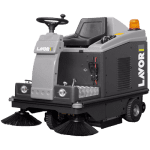 These are just a couple of the features of this unit which is capable of picking up much more than just surface dust and dirt. It is a seriously large space ride-on cleaning machine for big jobs. The SWL1000ET Ride On Sweeper/Vacuum is ideally suited to large sheds and open areas. The transport and similar activity industries are where this is best suited. If you have a stream of traffic leaving dust and dirt and light debris, then this machine for you. 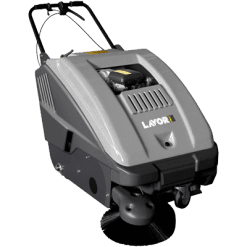 The SWL1000ET also ideal for large carpark areas or high rise carparks where both the forward and reverse traction makes the machine quite manoeuvrable in tight spaces.